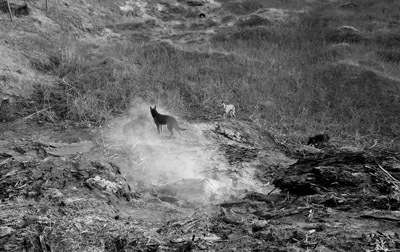 Yang Fudong, East of Que Village, 2007, still from a six-channel black-and-white video, 20 min 50 sec. In her essay for a forthcoming catalogue on Yang Fudong, critic Molly Nesbit recalls how, as a young student at the China Academy of Art in the early 1990s, the artist encountered footage of Joseph Beuys’s 1974 man-meets-coyote romance I Like America and America Likes Me. Made in the wake of his epic five-part film Seven Intellectuals in Bamboo Forest, 2003–2007, Yang’s latest video installation, the six-channel East of Que Village, 2007, gives evidence of a debt to Beuys’s parable. Here Yang leaves his beloved sophisticates far behind, turning his eye toward northern China’s bleak plains, a landscape hostile to cultivation, where packs of wild dogs savagely fight for survival, ravaging offal, clawing at doors, and unsentimentally, violently, passing away. At times, it resembles a National Geographic documentary, but it lacks the trajectory—the contrived, anthropomorphic bathos—imposed by that genre. If there’s a narrative, it’s accidental. One gimpy dog gets a lot of airtime, but otherwise the cast is hard to follow. Humans make occasional cameos, sitting for long spells indoors, but they aren’t protagonists so much as placeholders for fraught domesticity. Disjointed, poetic, evocative, and—as one has come to expect of Yang’s work—genuinely beautiful, East of Que Village is a ravishing study of antagonism on the fringes.